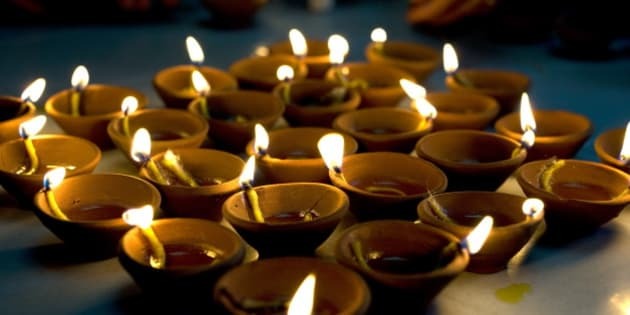 Diwali, the festival of lights is one of my favourite times of the year. The food prep, the gift prep, the pujas, the family parties and the mithai boxes can be so much fun but the gift-giving and parties can also keep things very busy! But at its core, is its beautiful way of bringing light into the home. I'll be having that big Diwali party at home soon and decor is the most fun part of this gathering. We all know that lighting is key during Diwali, but why not find creative ways to light up your home other than a traditional clay diya? Lanterns are stunning ways add light to the outside of our home. Some of my favourites include moroccan style with at bit of bling and metallic net-style. You can also get the accordion type ones which collect sunlight all day and turn themselves on to cast a beautiful glow by night. They are constructed of heavy duty nylon for outdoor use and available in various colours and shapes. 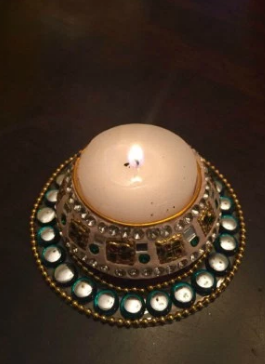 I love how a jewel/sindhoor box can add bling to a tealight! I got these for a South Asian baby shower a while back and loved the way you could put them with each table setting. You can do the same for your Diwali dinner table. You can also give it a base that you can glue on using floor rangoli made from plastic. 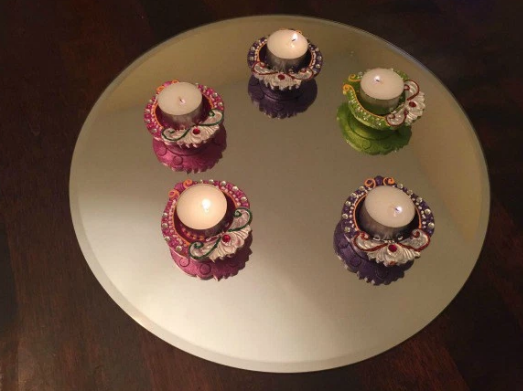 Tealights can be purchased from your local grocery store. These are super easy to make using crafted store-bought diyas available at your local grocery store and ready-to-use floor rangoli. 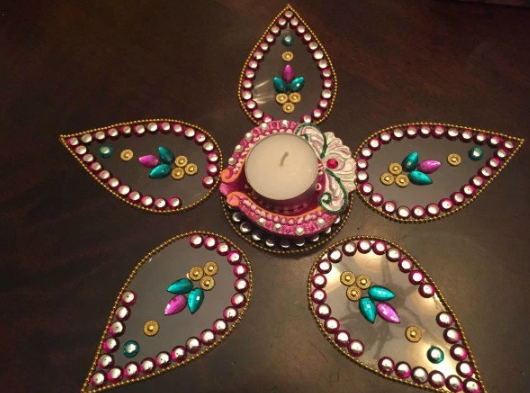 Just take floor rangoli, make your desired pattern, on a mirror base and add diyas! You can create any pattern you want for the perfect centrepiece for your Diwali dinner table. If you've got beautiful traditional diyasdiyas, use a mirror base to add reflection to your centrepiece. It's a great way to add sparkle when the lights are turned down at dinner. I saw this paper lamp over on my favourite Diwali board on Pinterest and couldn't believe how easy it is to make. All you need is paper bags of various sizes sizes, add doilies and an LED tea light inside and you're set! The effect on lighting in a room is fantastic. This is another easy DIY for a long table. Simply using glass holders and mason jars with tea lights, all available at your local grocery store, and a bold table runner creates the perfect lighting for a dining room. You can even add flower petals on the runner itself to add colour. Who knew you could just repurpose a cake tray? Simply take a cake tray add flowers, tea light or candle and you're done. Add the candle in the middle with flowers around to make a great statement piece on a dining table.